First lady Michelle Obama arrives at the presidential inauguration at the Capitol building wearing J.Crew gloves and a sash as a belt. Love the sparkly belt Michelle Obama wore over her Inauguration Day jacket? 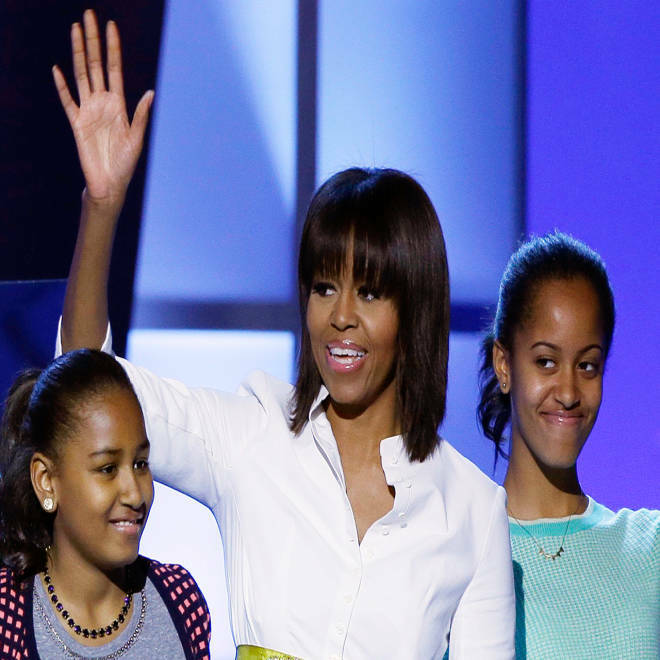 How about the deep plum overcoat worn by her daughter, Malia? Don’t bother to search J.Crew’s website for either item, because both are being retired, the company’s creative director told TODAY on Tuesday. 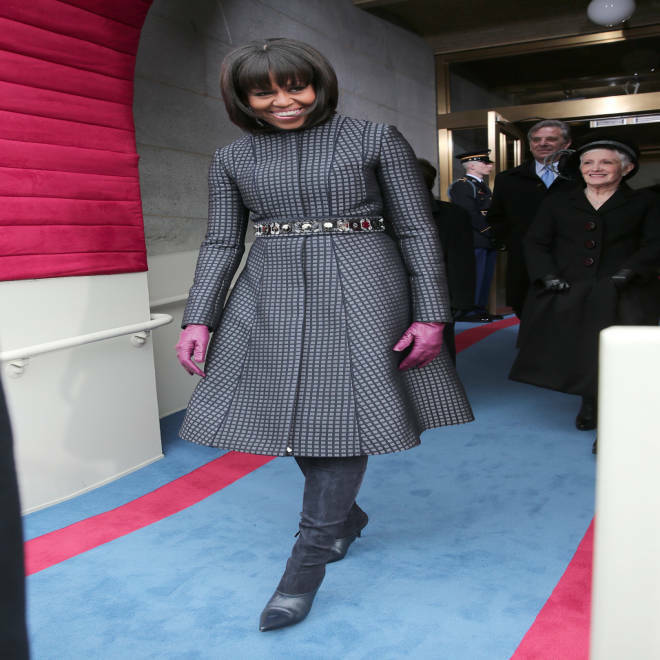 In addition to Malia’s coat, J.Crew also designed Michelle Obama’s gloves and the rhinestone-studded belt she wore over her royal blue custom-made Thom Browne coat. Lyons reminded TODAY’s Matt Lauer that the first lady is known for pulling pieces out of the closet more than once, including items she purchased from previous seasons. That pattern applied to the sparkly belt Obama had on display Monday. Lyons said she feels humbled to have the first family wear so many of her items in such a public venue. Another designer feeling the bright glare of the inaugural afterglow is Jason Wu, whom Obama selected to design her inaugural gown for a second time. First Lady Michelle Obama in 2009 (left) and Monday night (right). Both gowns are by Jason Wu. 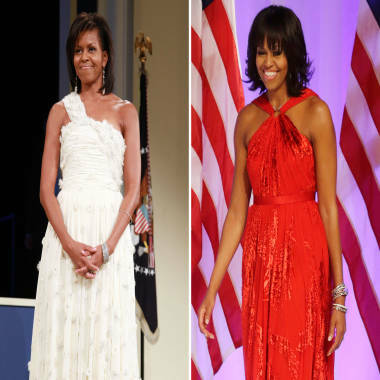 The 30-year-old Taiwanese-born designer skyrocketed to fame after the first lady chose to wear his white frilly one-shoulder gown to the president’s 2009 inauguration ball. Wu said he didn’t know Obama would be wearing his creation until she actually appeared Monday night in the red chiffon and velvet gown at the official Inaugural Ball. “We had no confirmation until the second she came out,” he said. Until then, he and his staff were watching the inauguration live from work. “Nobody wanted to take any breaks. We were like glued to the screen,” he said. Wu said he submitted the design and then worked closely with the first lady’s team to achieve the right fit and look. He expressed his surprise moments after the big reveal in a one-word tweet: #Inshock!!! Wu’s inaugural dress, like the first one he designed four years ago, will eventually be donated to the National Archives. “Just to sort of realize its place in history, my work in American history is amazing,” he said.